I work with lots of marketers and entrepreneurs. Some of them are early in the game, but most have been at it for awhile and are starting to gain momentum. While this question seems simple enough, actually answering it with confidence can be tricky. I’ve sat in boardrooms with super smart teams—teams that have built insanely cool technology and raised millions of dollars from investors—and I’ve listened as they debate back-and-forth about which customers they *actually* serve. By the time I’m sitting in their boardroom, these teams are beyond ready to ramp up their growth. They want to pour fuel into their rocket and blast off—like yesterday. The soul-crushing truth is that if you’re not targeting the right customers with the right messages, investing more $$ in marketing may not work. It’s just too damn noisy out there. Your whole team needs to be in alignment on who your best customers are and how your product makes their lives better. If they’re not, prospective customers will just ignore you. Enter, the “customer persona.” (This is also sometimes called an “ideal customer avatar”). Creating a customer persona is an important exercise that can help get your team on the same page. I know. Those numbers are crazy, right!? If you’re sick of the “spray and prey” approach to marketing and want more clarity and direction about where to invest your time, you should create personas. Since the core of my business is Customer Camp—a series of in-person workshops where participants work to identify their most profitable customers and figure out what triggers them to buy so they can drive new growth—I guess you could say I’m a bit of an expert when it comes to creating personas. I’ve added a few of my favourite resources below to help you get started. My two cents: Full disclosure, I’m a total ForgetTheFunnel fan girl. I’m excited to be a guest myself! My episode goes live in May. Stay tuned. As one would expect, Claire and Gia do an awesome job of explaining why personas matter and they share two complementary approaches to help create your first persona. This webinar is super actionable and full of additional resources. It’s awesome! (If you watch this and still want 1:1 help to actually get the work done, and you live in Nova Scotia, Canada (or don’t mind travelling there), you should come to the next Customer Camp workshop in May). A quick word of caution… some marketers, myself included, believe that HubSpot’s persona template is too focused on demographics (eg. age, gender, and income) or firmographics (eg. job title, company size, etc.). As Clayton Christensen argues in his newest book, Competing Against Luck: The Story of Innovation and Customer Choice your customers don’t buy your products because they’re “a 22-year-old male who works in marketing and has two dogs.” They buy products because they have specific jobs they’re trying to get done in their life or progress they want to make. Learning more about Chirstensen’s approach to understanding customers really was a game-changer for me (and I don’t use that word lightly). It completely reframed how I think about marketing, growth and building products. If you’re interested in learning more, I dive deep into how to use a unique style of customer research to identify what really triggers customers to buy in my “Trigger” workshop. My two cents: Amy’s podcast is one of my top faves. She always goes above and beyond to make her content super actionable and, as usual, this podcast episode won’t disappoint. Amy refers to a persona as “an ideal customer avatar” but the concept is basically the same. Amy also provides a worksheet as part of this lesson. But again, I’d caution you not to put too much emphasis on the demographic stuff when creating your own customer avatar (aka persona) because, as I said before, that stuff doesn’t really get at the root of what motivates customers to buy. My (totally biased) two cents: Customer Camp is a series of in-person, hands-on workshops for growth-ready entrepreneurs and teams. Personally, I’m a big fan of learning by doing. There’s nothing more frustrating than investing a bunch of time learning about a particular topic without having time to actually apply what you’ve learned. I’ve tried and tested many different approaches to creating actionable customer personas. I’ve combined my favourite elements into my own persona template. And, as you’ll learn if you attend Customer Camp, the best customer personas are based on research—not just assumptions, anecdotes or guessing. That’s why we’ll devote a whole workshop to using customer research to identify your ideal customers and figuring out what triggers them to buy. Do you like learning by simply rolling up your sleeves and doing the work? Do you also live in Nova Scotia, Canada? If so, you should apply to attend the next Customer Camp. Space is limited and funding is available to reduce/cover training costs. 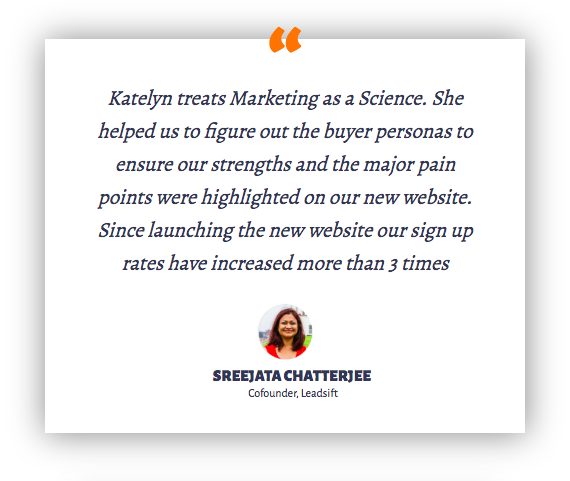 If, like Sreejeta here, you’re working on a new project—like a new website, marketing campaign or product/service—and you really want to maximize your ROI, this is the perfect time to finally figure out who your ideal customers are. How have you used personas to drive new revenue? Or, if you’ve tried creating personas before but didn’t get results, what challenges have you had? Comment below so we can chat about it.